I've been invited to a wedding shower and I think it's been about 30 years since I last went to one. 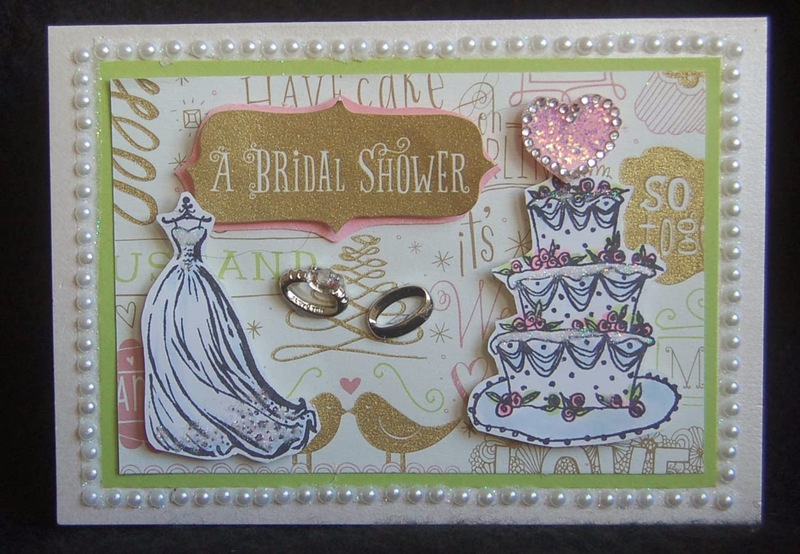 I thought it might be amusing to see if I could use the shower invitation to make a wedding shower card. Here is the result. I removed the panel with the words and cut the front of the card to use for the background. The dress (Inkadinkado) and cake (Hero Arts) were stamped on marking pen paper and lightly colored in. Then they were mounted on foam stickies. A sparkly heart was pressed onto pink paper, glittered in and cut out to mount on the cake. Dress It Up wedding rings were glued on. For the final touch, rows of half pearls were attached to the frame of the card. 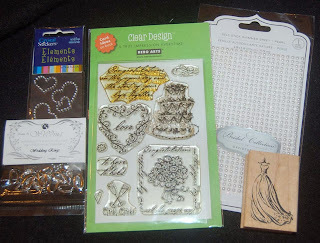 The card of pearls was purchased in the Ben Franklin Crafts wedding section. They make placing the pearls super quick because it already has adhesive so you simply have to cut out a row and apply it in one long string. 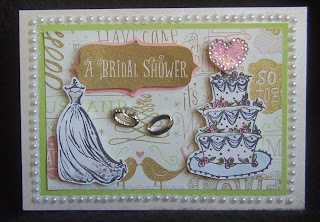 It was fun to try recycling the shower invitation into a shower card. Maybe it might be fun to try turning a birthday card into a thank you card....give it a try! This second set of tags are simple to make too. Cut the scrap pieces with the die. 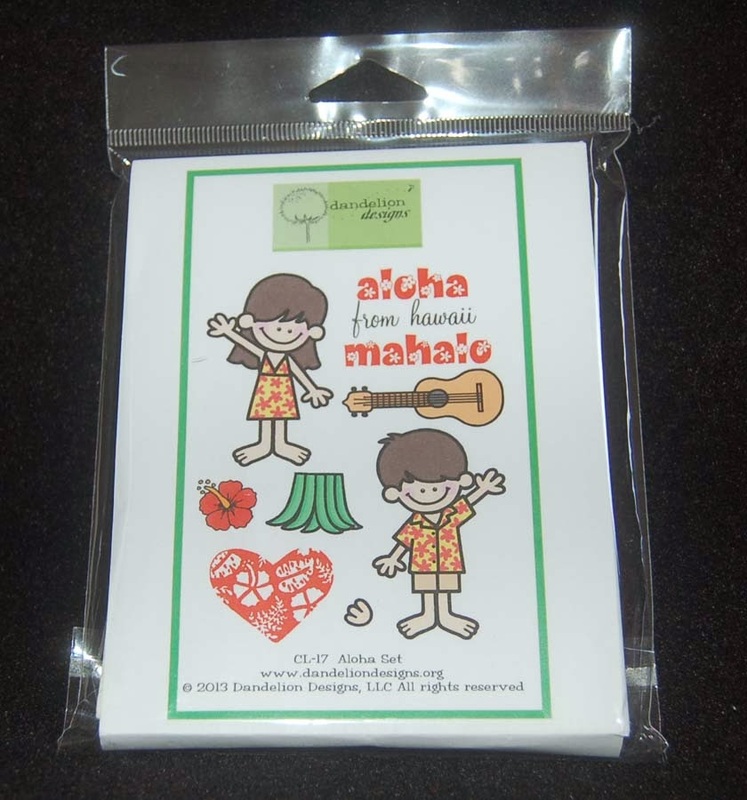 You can lay several paper pieces on the die to cut assorted cards and holders at one time. Then apply the Authentique stickers (from a 12x12 sheet) and glue on the Dress It Up holiday buttons. Xmas twine was strung through small holes punched in the pieces. Note: The card on the left has twine attached to both the holder and enclosure card. The twine can be strung around the ribbon around the gift and then tied to the other loose twine end to ensure a secure tag that won't get lost from the gift. I hope you're relaxing now and perhaps like me you are enjoying playing with your Christmas craft goodies for a little bit more.....enough to get a jump start on NEXT Xmas! Hope you've checked out the clearance items at House Mart Ben Franklin Crafts....so many bargains on holiday supplies. You know you'll wish you shopped early.... remember Xmas is only 363 days away! 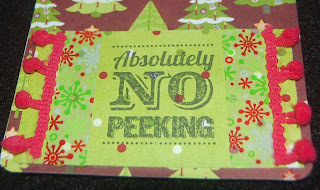 Okay, we're coming down to the wire for Christmas crafting, but I just had to show you this one die wonder. 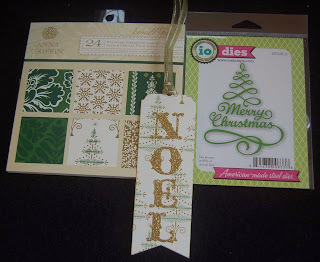 The elegant die is an Impression Obsession die which I used on a sheet of green foil paper from the American Crafts 6x6 pad. 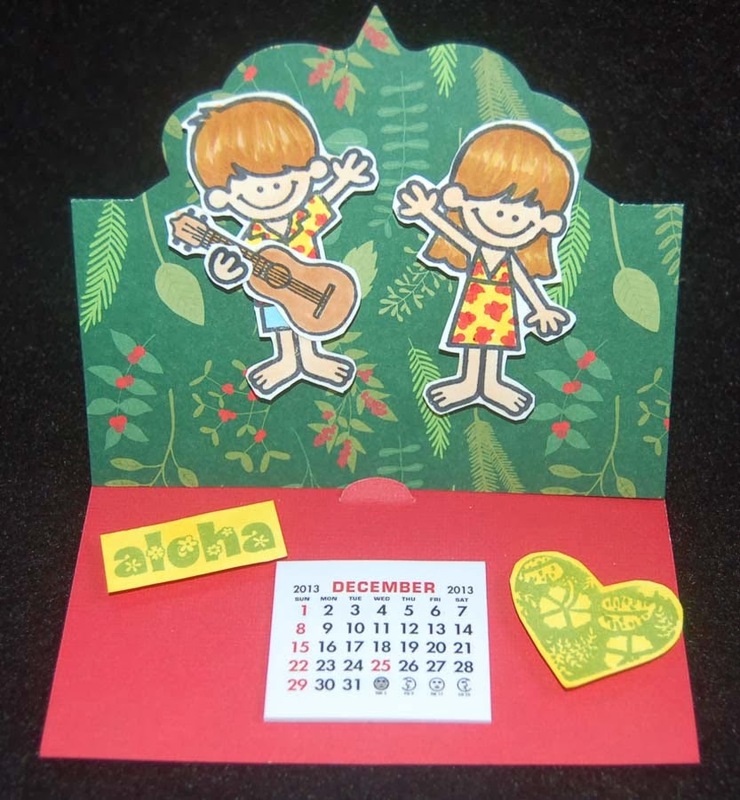 A Sizzix magnetic platform will make cutting out the foil easy because you can run it through several times without the foil or die shifting. 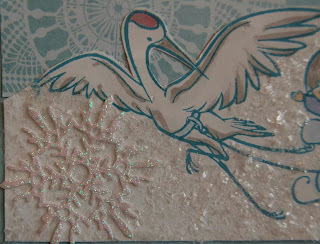 For the background I cut a piece of card stock from an Anna Griffin 6x6 paper pad. The die cut green foil tree was run through my Xyron to apply a sticky adhesive to the back. To take care of any extra stickiness after the die cut is applied, dust the card surface with cornstarch. There was a piece of card stock left over that was just big enough to cut a bookmark tag. (See Paper Smooches die set in previous post.) 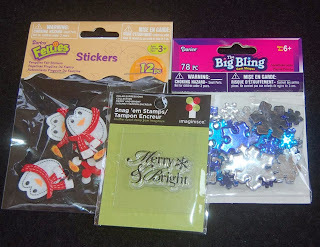 The NOEL letters were stickers from a Studio G set ($1.25 for a generous sheet). 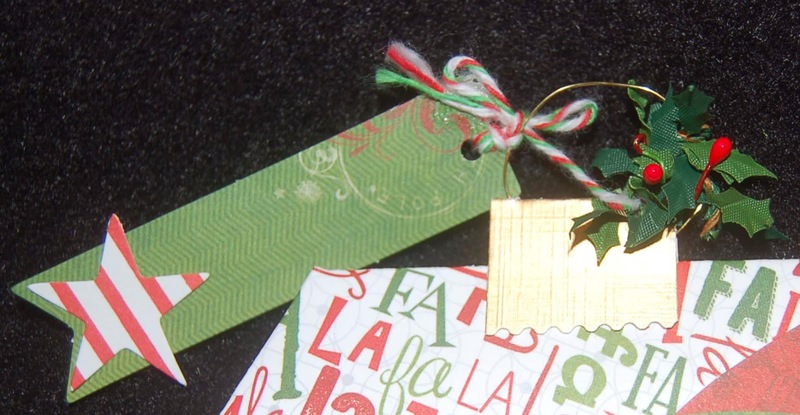 A little gold ink was rubbed on the edges and a gold edged ribbon was tied on to complete the tag. I've always admired the simplicity of the Japanese cards that I receive and I think that this card has a similar feel. 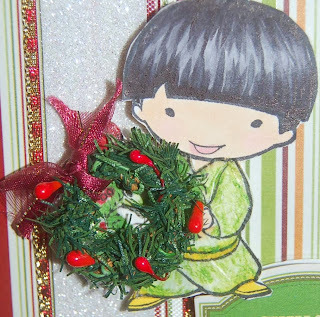 Perhaps I will be a good girl and craft a bunch of these cards and tags for next year since I never seem to be prepared for the holiday season. It's never too soon to start....right? Merry Christmas to all and to all a crafty New Year! 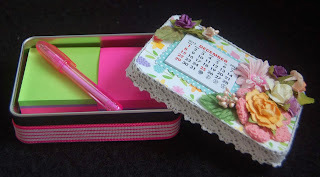 Usually I start my post with a finished product, but today I wanted to show how you could start with a plain tin or empty candy tin and quickly turn it into a pretty, useful gift......a calendar tin! First, I picked a printed paper and traced the tin (top and bottom). 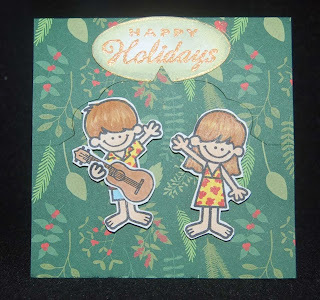 Double-sided paper looks great with one design on top and the coordinating side on the bottom. Next I cut and ran the pieces through a Xyron machine (from Ben Franklin Crafts) to apply a sticky backing. After adhering the pieces to the tin, a lace trim was added to the lid edge and ribbon was attached to the tin bottom with Merikan double stick tape. 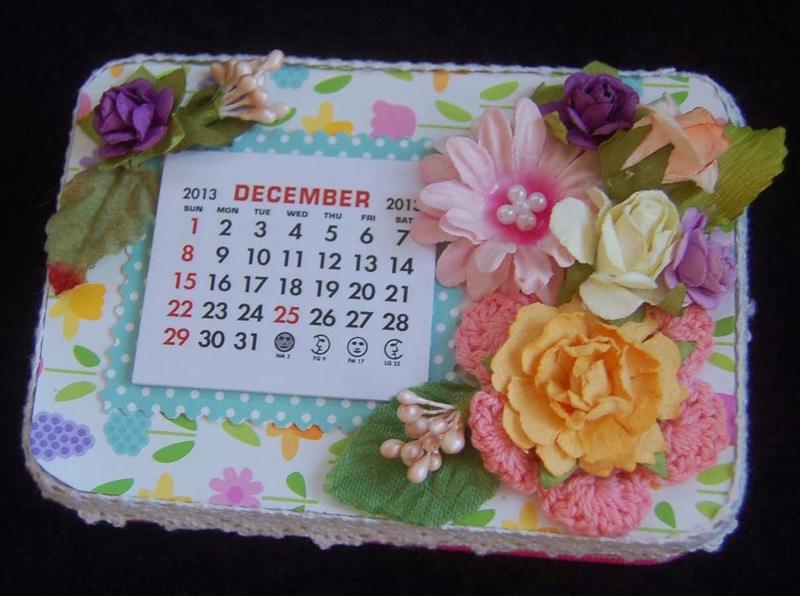 A mini calendar (from Vippies) was off-set on the lid top and flowers were added. Inside the tin I included some Post-It pads and a mini pen....a perfect fit! I used basically the same procedure for decorating the candy tin (great recycling project for schools). The sentiment under glass is stamped on coordinating paper and cut to fit the glass (pieces from Ben Franklin Crafts). The paper is then run through the Xyron machine so that the sentiment side gets the sticky adhesive. After the paper is attached to the glass it is further trimmed if necessary. A sheet magnet (trimmed to fit) is attached to the back of the glass pebble with sentiment. The magnets can be used to hold reminders. Inside the tin you can pace a mini pen and paper strips cut from used computer paper.....great for a recycling project! If you are on a tight budget, I think you will find this useful project money saving and appreciated by almost everyone. Most of the supplies for these calendar tins were purchased from House Mart Ben Franklin Crafts. Thank you for stopping by today. I hope you found this post interesting. Please leave a comment if you can. It's so much fun to hear from you. 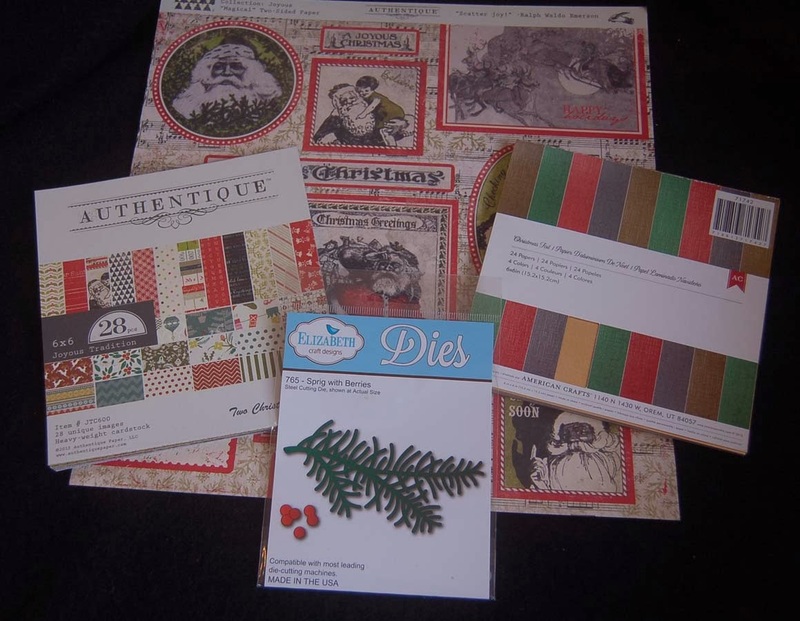 As usual I was drawn to the Authentique line of Christmas papers. 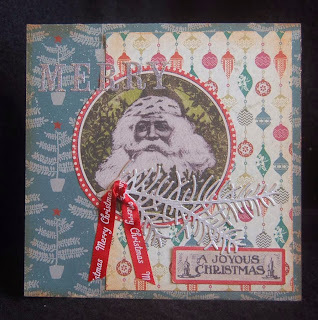 I especially loved the textured ones and the vintage images but I wasn't sure how to use the 12x12 sheet of images. Finally I decided that I would get the most out of each sheet by cutting out the pieces, like the Santa that I used here. 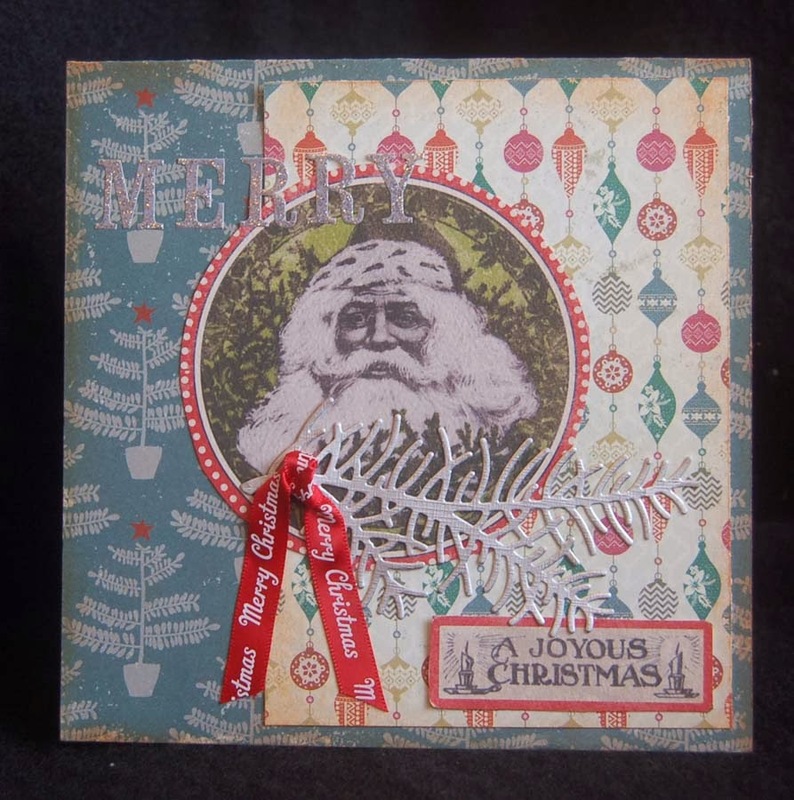 By using half of a 12x12 sheet I formed the card base and then it was simple to add on the label (from the same sheet as the Santa image), the Elizabeth Die cut silver foil pine branch, American Craft ribbon, Studio G letter stickers, and piece of ornament print paper (from 6x6 Authentique pad). 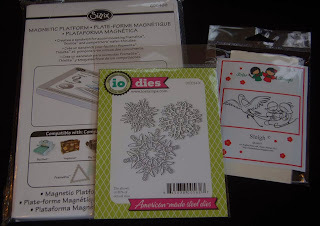 If you use the American Crafts foil paper and the Sizzix magnetic platform, you will probably be more successful in cutting intricate die shapes like the pine branch. With the leftover strip of Authentique paper, Studio G sticker ornament, and a die cut green foil pine branch, I crafted a tag. 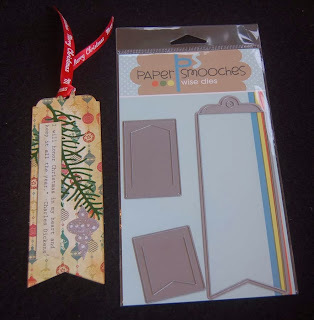 The bookmark tag was cut with a Paper Smooches die. The Charles Dickens quote was taken from the border of the Authentique 12x12 sheet. 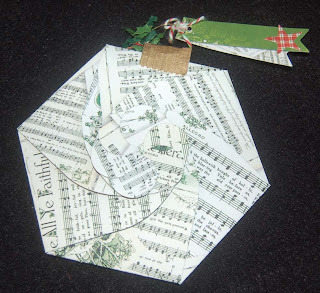 Most of the supplies used on these projects were purchased at House Mart Ben Franklin Crafts. I hope you're still having fun crafting pretty things for Christmas. Remember you can always save them for next year. I usually don't get going until mid-December so much of what I make now will be used next year. You should keep a lookout for soon-to-be-discounted craft supplies at BFC so you can hoard them for future projects and be so ready for Christmas 2014! 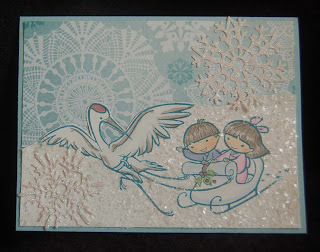 The Sister Stamp used on this card is probably my favorite release of the season. It took me quite awhile to decide how to use it. After seeing many white on white cards this year, I decided that was the look that I wanted to achieve. However, as you can see I didn't quite achieve it as I couldn't resist adding a bit of color to bring out the image. 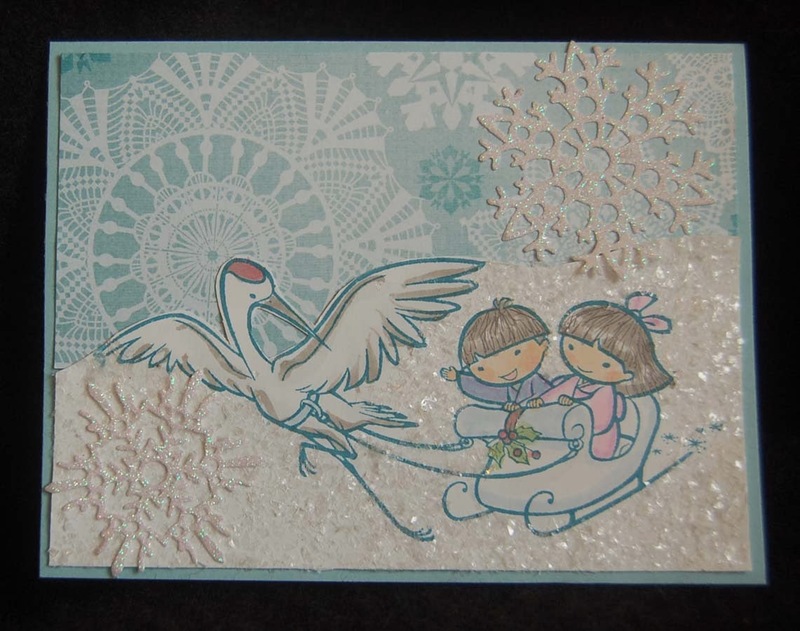 A crane pulling a sleigh has a definite magical quality, which seemed to match well with the Bo Bunny snowflake card stock background. To further add to the magic, I added a generous sprinkling of Martha Stewart's 'snow' glitter and cut out just part of the crane as it rises above the snow. In the close up you can see the detail of the snowflake that was delicately die cut from American Crafts glitter paper (from the 6x6 glitter pack) using the Impression Obsession die shown in the photo below. I forgot to photograph the glitter paper pack, but it is an important element in the making of a delicate snowflake like this one. 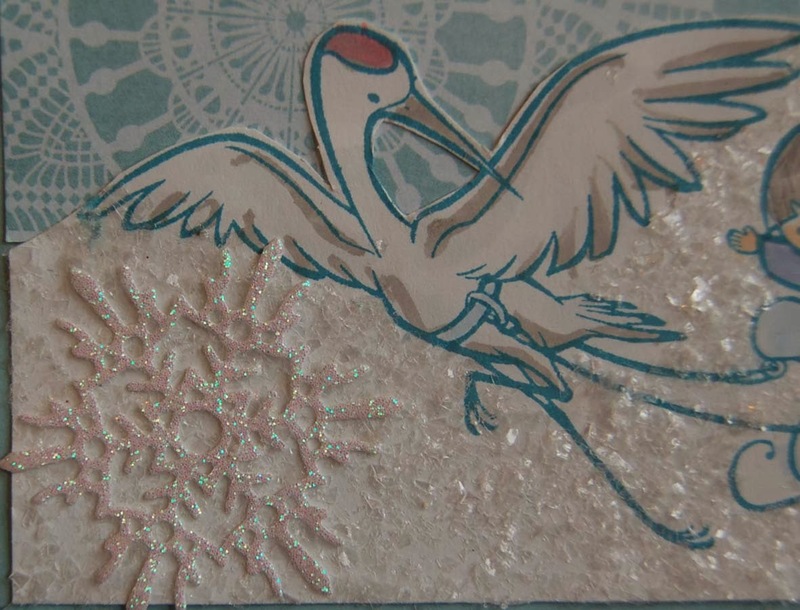 Many glitter papers are too thick or not strong enough to be cut with intricate thin dies. Also critical to the making of die cut snowflakes is the Sizzix magnetic platform which will successfully hold dies in place while rolling them through a die cutting machine. I LOVE my magnetic platform! 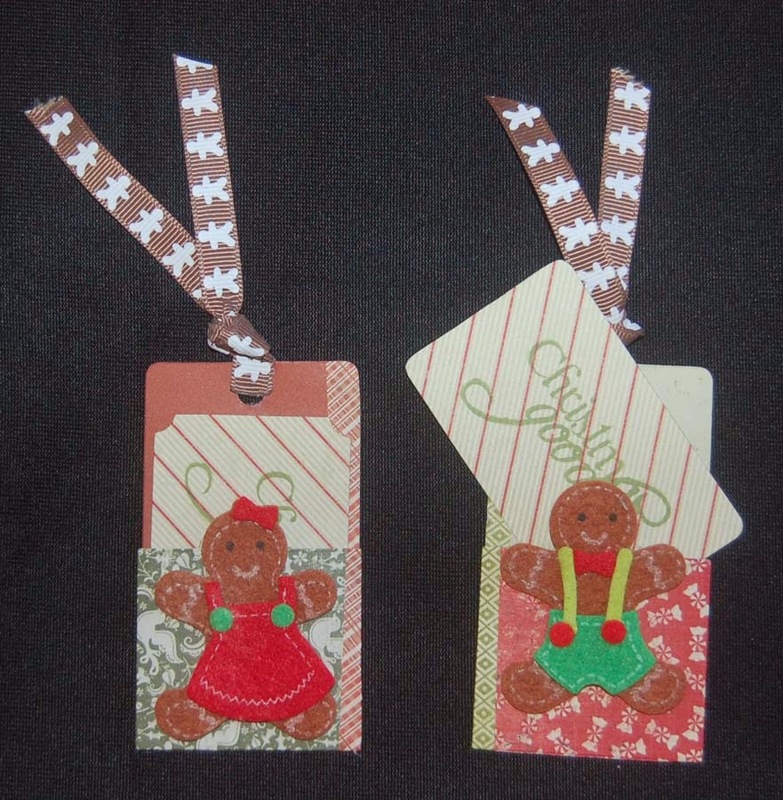 After making a few cards, I had enough Bo Bunny paper leftover to make several tags. To keep everything simple I just die cut the paper with Tim Holtz's tag die and stamped on the Imaginisce sentiment. 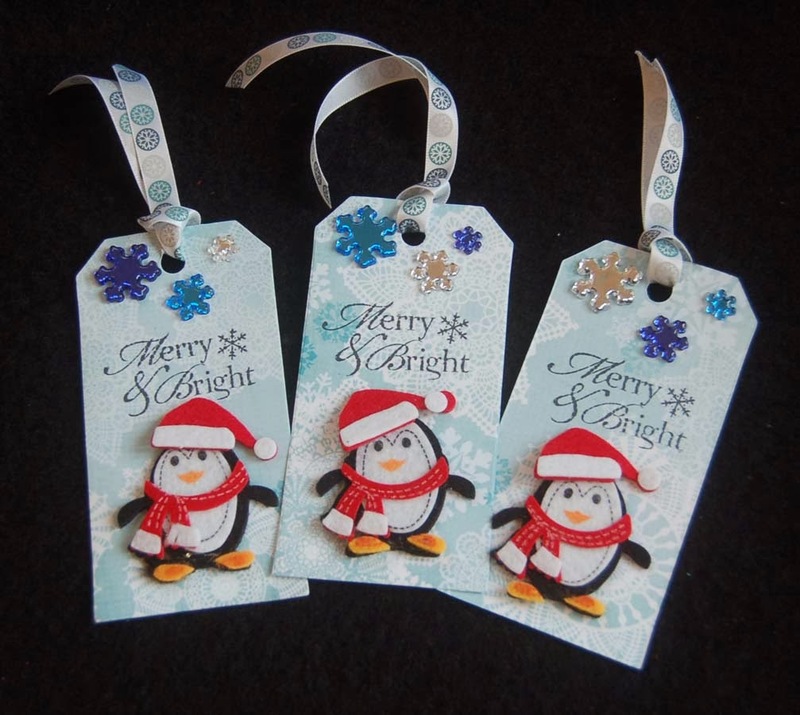 The Darice Felties penguin stickers, Big Bling acrylic snowflakes, and American Crafts ribbon were simple add-ons that make the tags special. 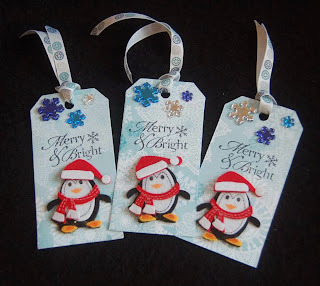 I just love the cute, detailed penguins that I purchased at Ben Franklin Crafts. 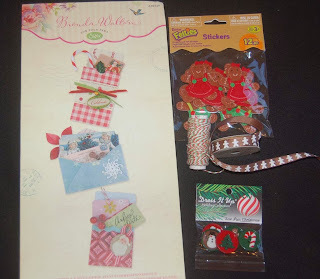 There are lots of other seasonal Felties which can inexpensively and quickly give a holiday look to your crafts. I hope you've enjoyed this post even though it was super long. Thanks for taking the time to read through all of it. Happy Holiday Crafting! Now is the time that I start to panic as I realize that I may not get it 'ALL' done before Xmas. Since this year I am mostly giving gift cards (easy to mail and one size fits all), I decided to work on gift card holders first. I may have seen something like this on someone's blog site but I think the idea came to me as I was falling into dreamland. 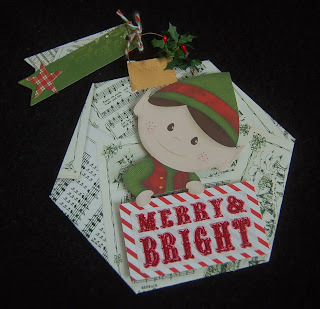 The hexagon shaped ornament was easily die cut with the Big Pro Sizzix CD holder die. (If you don't own a Big Pro machine, you can check at your local Ben Franklin Crafts to see if they have the die available for free in store use....you only need to buy the paper!) To make this project even more speedy, I used the Bo Bunny die cut elves (from a package of assorted pieces) who match the Bo Bunny 12x12 card stock that was used for the holder. The signs that the elves are holding are simple shapes cut from scraps and have Studio G glitter stickers ($1.25 a sheet) applied. Here's a close-up of the ornament top. The gold part is just a piece of gold foil paper (from American Crafts 6x6 pad) folded and trimmed with a scallop edge scissors. Gold wire was formed into a circle and placed in the fold of the gold paper. 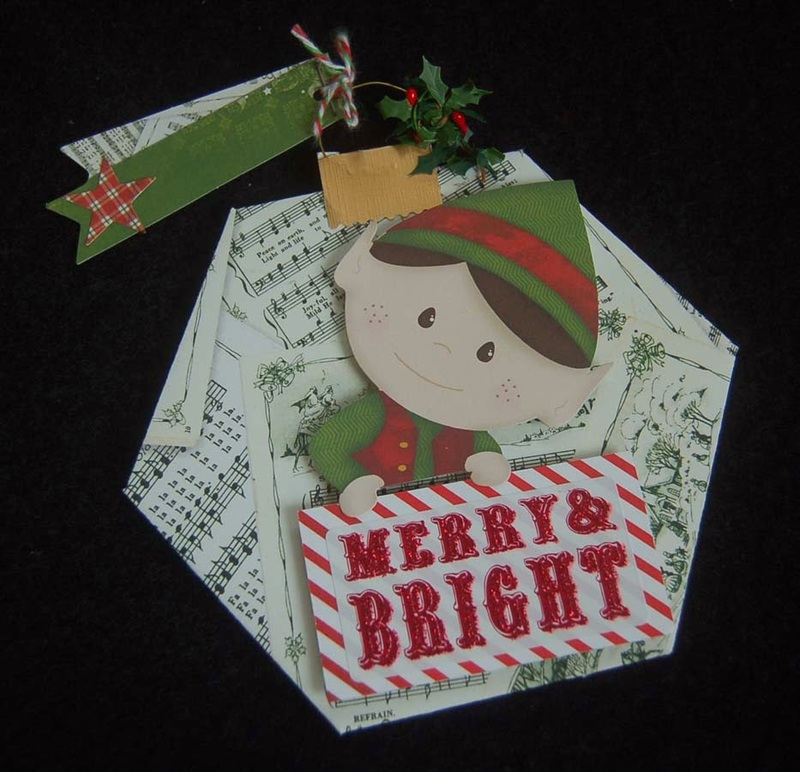 A piece of mini holly garland was added for embellishment and the banner tag (tied on with Doodlebug Xmas twine) was made using two pieces from the same package of Bo Bunny die cuts. This is what the ornament looks like from the back. I was planning to put the ornament cap on one of the corners but then realized that it would make the holder hard to open. Opened all the way, the holder has lots of room for a message or even a photo. In fact, the holder can probably accommodate some flat earrings or even better, a few folded bill$! 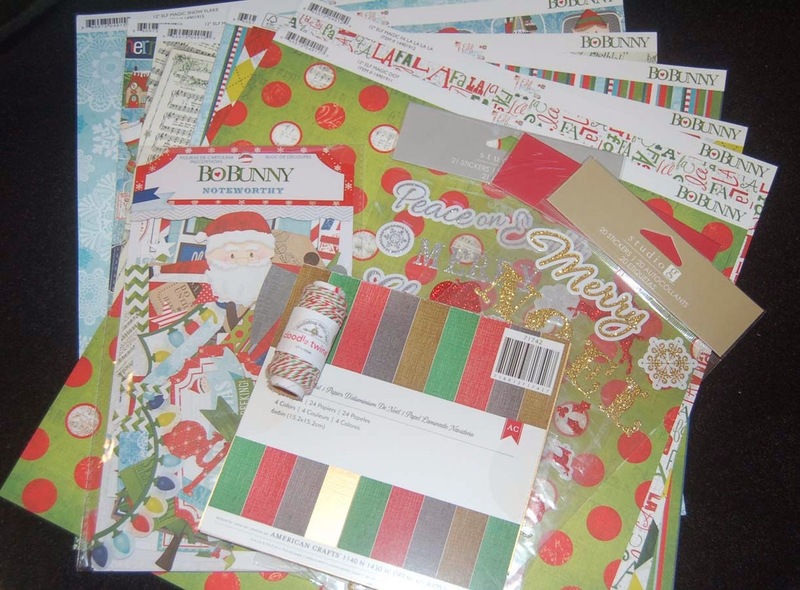 As you can see the Xmas line of Bo Bunny card stock is lovely and the pack of Bo Bunny die cuts has lots of pieces to work with so you can easily make many ornament gift card holders. All the materials used on this project were purchased from House Mart Ben Franklin Crafts. Well, gotta go and make more of these card holders and move on to calendars and thank you cards. Hope you're having fun crafting even though you are probably working into the wee hours of the morning. Hang in there, and thank you for taking the time to see what I'm doing during this holiday season. 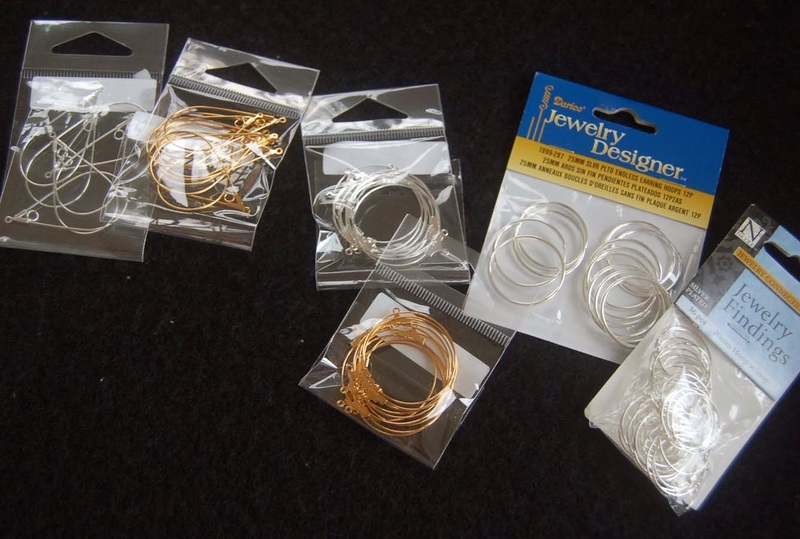 Jewelry pliers and wire snips are all the tools you'll need to assemble the bracelets. The findings were simple because they came in a set that included the metal part to attach to the leather, the chains and clasp. If you can't find the set, it is easy enough to find all the parts separately. To attach the 5" leather strip put a drop of jewelry cement on the end of the leather and squeeze on the metal end. 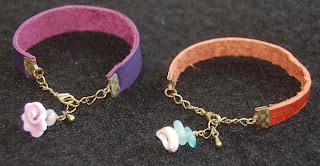 You will need additional jump rings to adjust the size of the bracelet. I like my bracelets to be a 7" circle. To add the shells and beads you will need head pins. I use three inch ones to make wire wrapping easier. 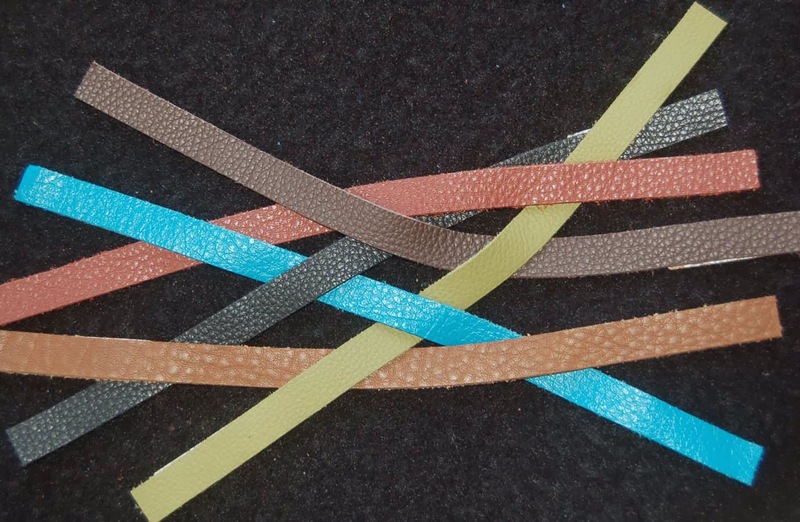 Besides the metal findings, you will be able to find leather strips at Ben Franklin Crafts too. These were sold in 10" lengths so you can make two average sized bracelets with each $2.99 strip.....BARGAIN! The thinner bracelet (in the top photo) used a strip from a giant bag of strips sold in the BFC leather craft department....yes, there's a leather department! I know that you will find these bracelets addictive to make and everyone will be delighted to receive one too. Happy Holiday Crafting! I tried to avoid the glare but I think this Martha Stewart cardstock ( from my stash) has a slight sheen. Anyway I wanted to do a quick post to show the kind of card I am including with my Christmas gifts to out-of-state friends. (Had to keep it simple because time is running out.) I spent quite awhile searching through my Xmas papers to find a print that looked both Christmasy and Hawaiian to match the Dandelion Design people. 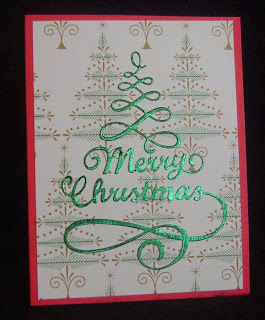 The 'Happy Holidays' oval is a little squished at the top but I didn't want it to interfere with the opening of the card. Once the card is opened, the mini Vippies calendar is revealed. 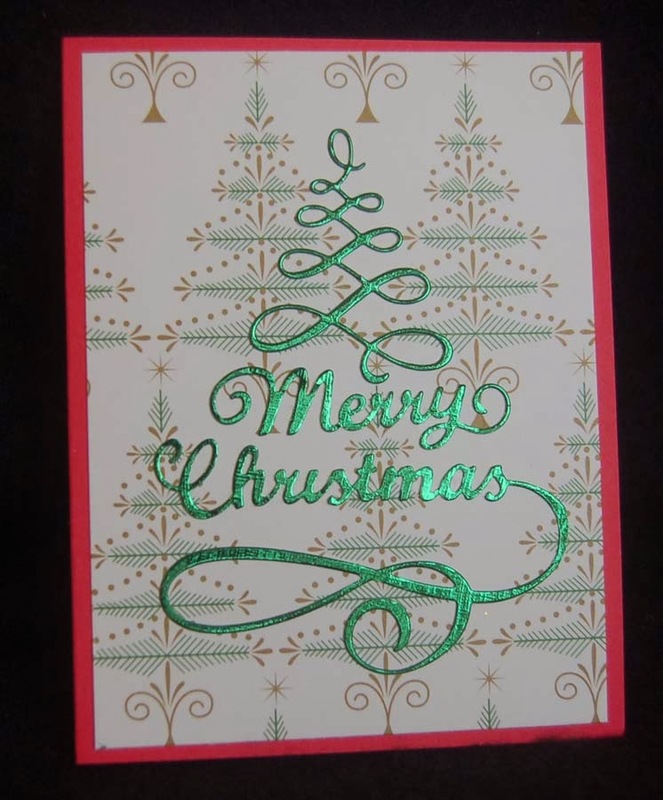 There is room inside the card for a message. 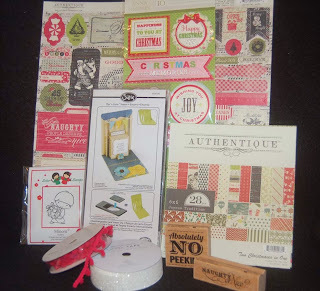 Pictured below is the DD stamp set which includes several other stamps that I did not use on this project. By keeping the holiday greeting on the top-half of the card front, it doesn't show when the card is set up so the card doesn't seem out of season during the rest of the calendar year. Oh, I forgot to mention that the die used to cut the base of the card is a Sizzix product (which I showed in a previous project). The Sizzix die and DD stamp set were purchased at the best craft store in Hawaii, House Mart Ben Franklin Crafts. 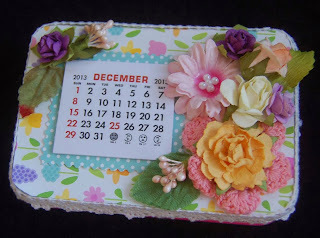 Okay, that's it for today....gotta go make more card calendars. Thanks for stopping by. I appreciate your interest in my blog. Shell jewelry is probably the hottest fashion trend in Hawaii. If your gift list is long but your funds are lacking, you'll easily be able to make these earring in a few minutes and at a fraction of the price that they sell for in boutique stores. 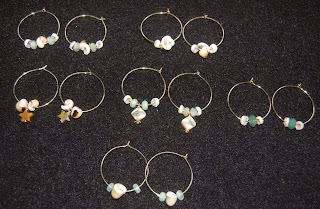 All you need is a pair of pliers to bend the ends of the hoops after you string on the shells and beads. Voila! You have instant earrings. You literally can make dozens in minutes. 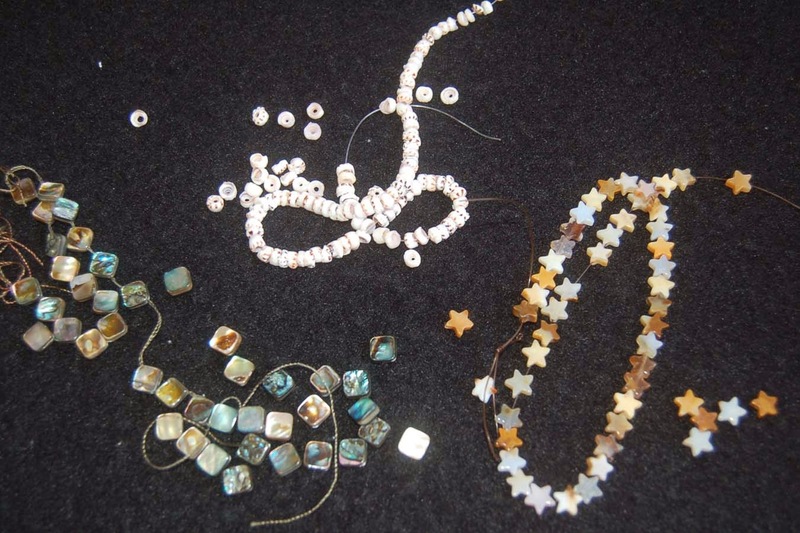 If you have a bit more skill with the jewelry pliers you can make these in minutes too. The teardrop wire shapes have rings for hanging the chains and earwires. All you need are head pins to attach the shells/beads to the chain and then use a jump ring to attach the chain to the ring in the teardrop. 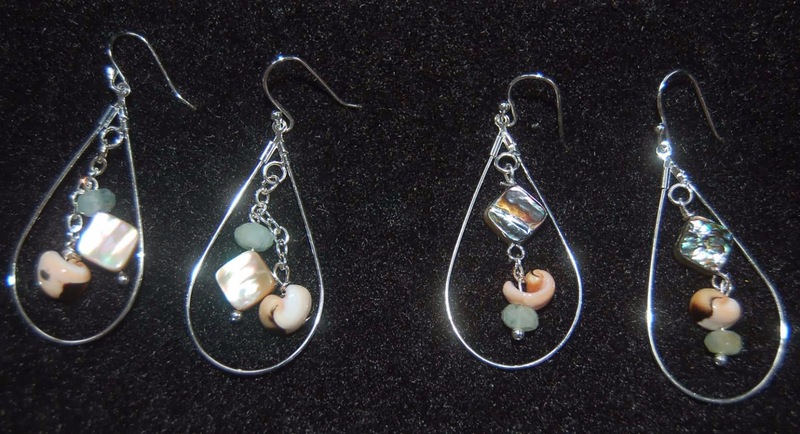 Ben Franklin Crafts has many beautiful strings of shell and gemstone beads and a great variety of jewelry findings for earrings. The hardest part of making earrings will be making a decision of what to buy. 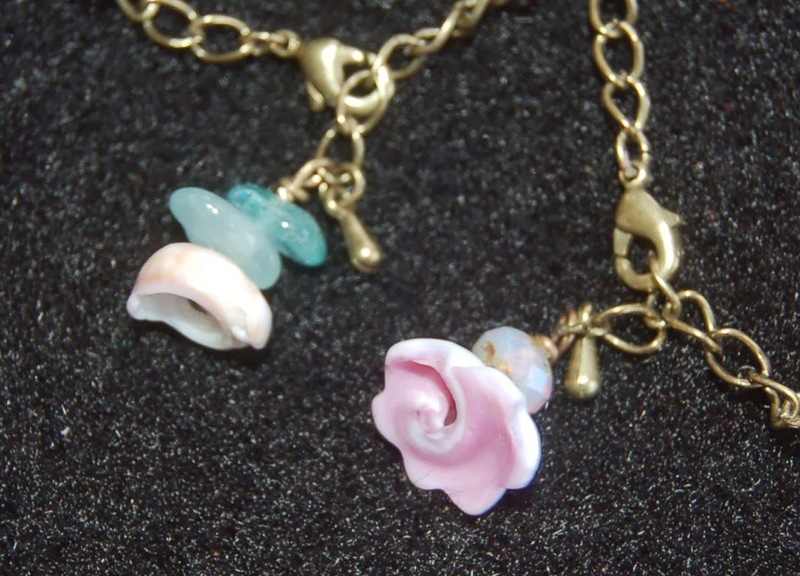 I know that you can solve your girlfriend gift dilemma by making shell jewelry. They'll love it and you won't break your budget. Go on visit HouseMart BFC and get what you need. It's not too late; you can do it! This rather simple card front hides the surprising inside. 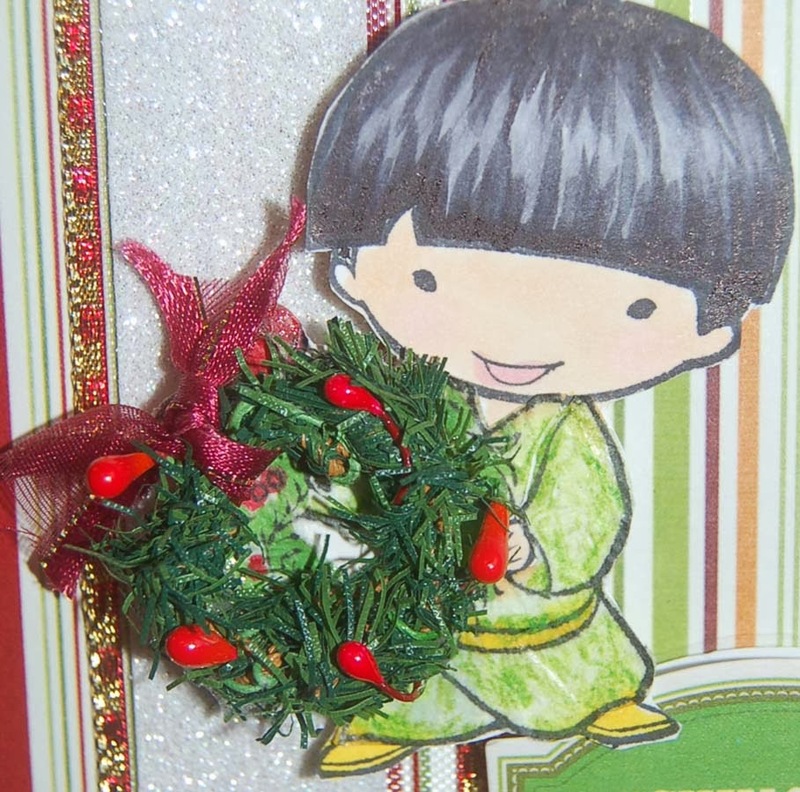 It started with the Sister Stamp Minoru image, colored with Copic pens and a paper pieced kimono. 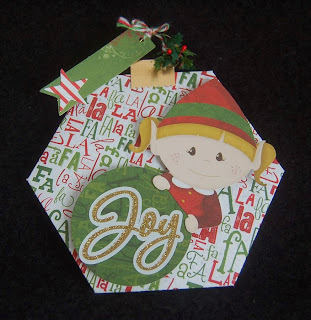 Onto a simple striped card (cut with the card frame Sizzix die), a wreath (made from a mini Xmas garland), a Anna Griffin dimensional sticker, American Crafts white glitter tape, and some holiday ribbon were added. When this card is opened up, moving 'eye-candy' catches your eye. The two peppermint candies (miniature Xmas tree decorations from Ben Franklin Crafts) really do move as they swing from the golden pipe cleaner arch. 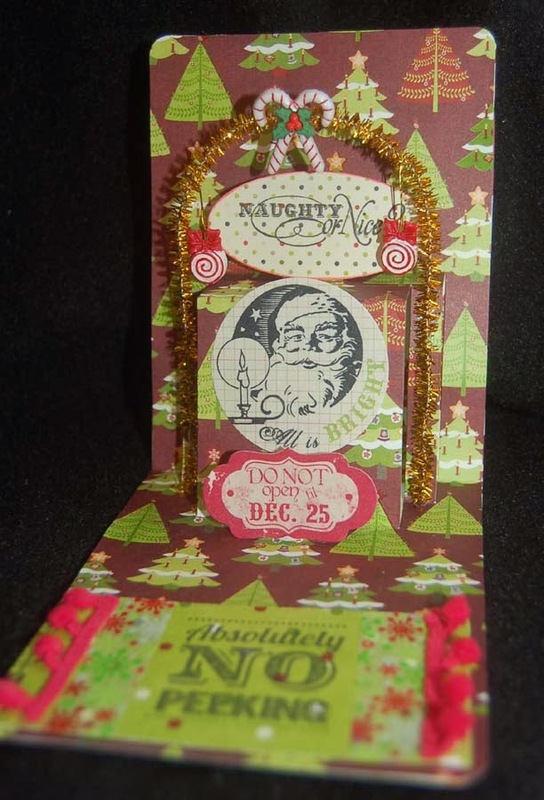 The Naughty or Nice oval was cut from an Authentique 6x6 sheet and inked with a Studio G stamp (only $1.25! at Ben Franklin Crafts). 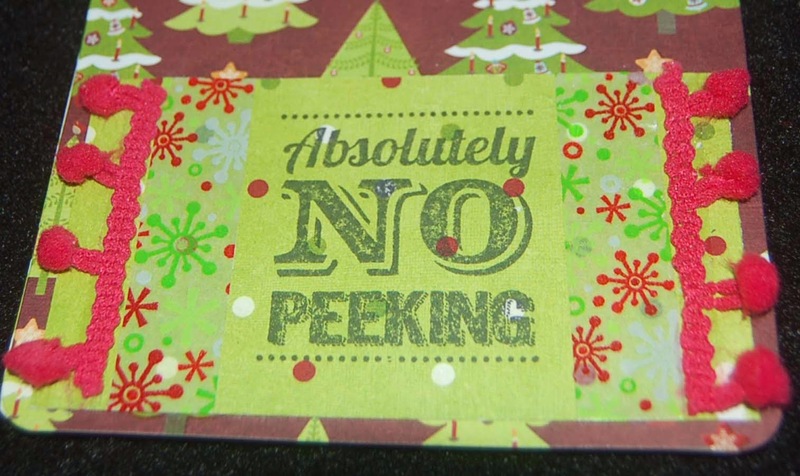 The Absolutely NO Peeking stamp is also a Studio G product. From House Mart BFC, Xmas washi tape and American Crafts pom pom trim were added to the gift card pocket. Can you guess what kind of gift card I'm slipping into the pocket? 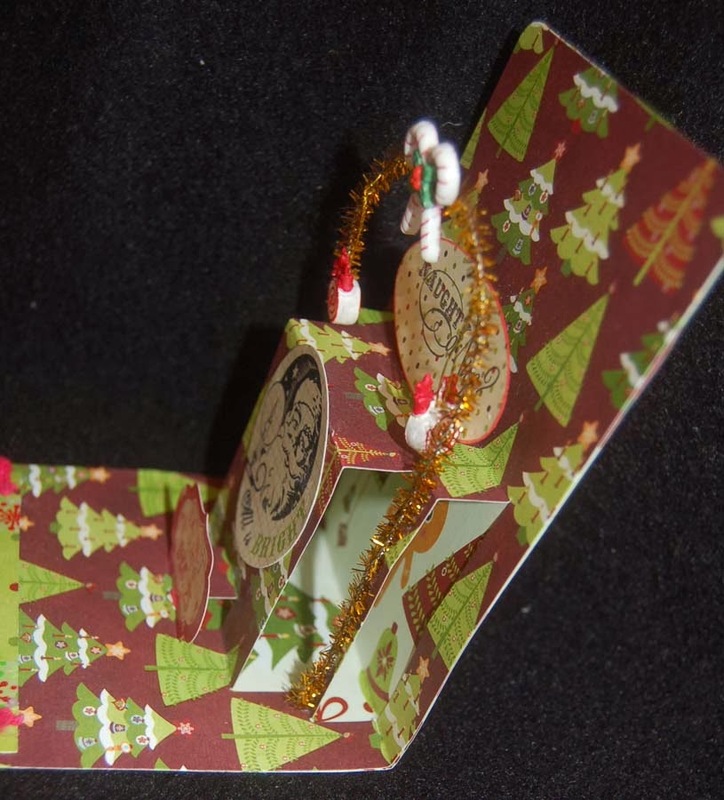 This side view shows the four pop-out areas made with the multi-tier 3D Sizzix die. This die requires that it be used with the matching card die shown on the package. The tiers allow for a multitude of design elements. I used Authentique stickers (from the 12x12 Xmas sheet) on two of the tiers. 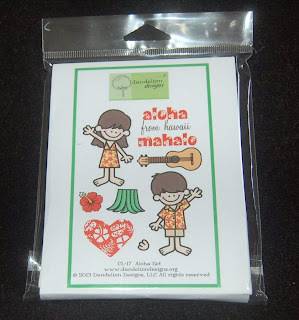 (Cornstarch was dusted on the back of the stickers after they were adhered to the tiers to prevent sticking when the card is closed.) 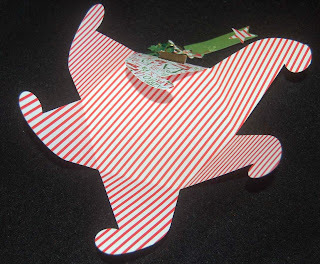 If you intend to mail this card via the U.S. postal service, add only flat pieces to your card so it will lay flat when closed or you will have to mail it in a pouch. 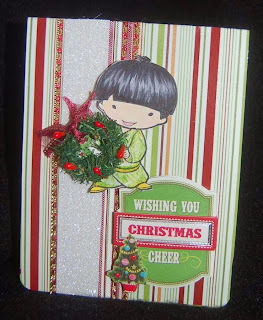 My card was a bit bulky...but festive...LOL! I plan to hand deliver the gift. 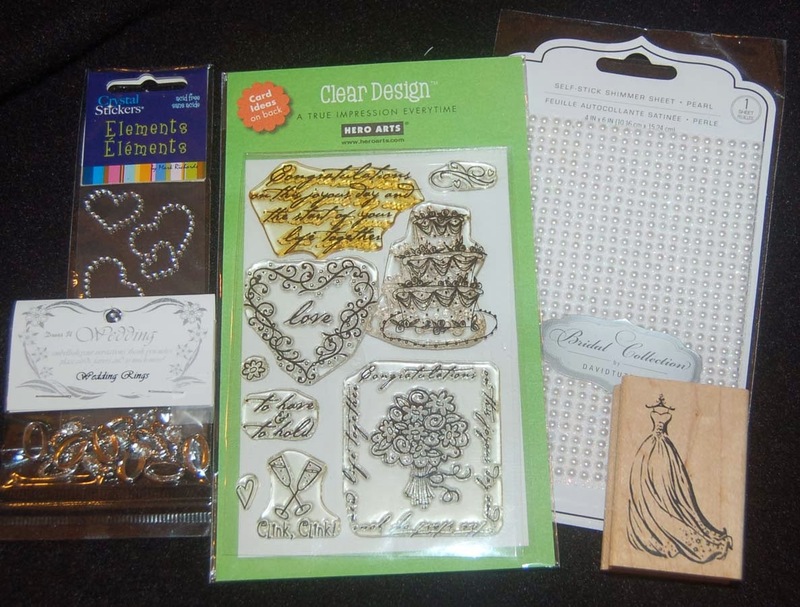 All of these fantastic supplies (and more not shown) were purchased at House Mart Ben Franklin Crafts. 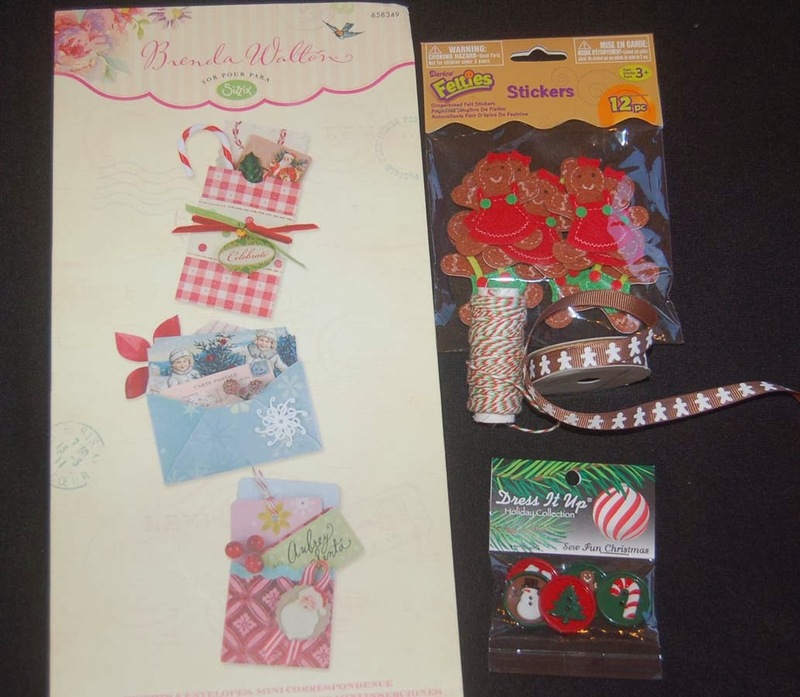 I encourage you to check out all the holiday crafting goodies available now at BFC. I know you will be as delighted as I am every time I shop there. Thank you so much for visiting this blog site. I am grateful for your support and encouraging comments.